My MAC Naughty Nauticals pigments and polish just arrived! Let's get to the good stuff. Index and ring finger are MAC Naughty Nautical. Middle finger is OPI Yoga-ta Get This Blue, pinkie is Essie Aruba Blue. My thoughts? I love the Naughty Nautical polish. It's completely opaque in one coat and the color really has depth. I'll try to take better pictures, but the lack of sunlight doesn't help. As for the pigments, they all seem to be that weird flaky texture that's hard to work with. I like the colors, but Lark About is much sheerer than I anticipated. 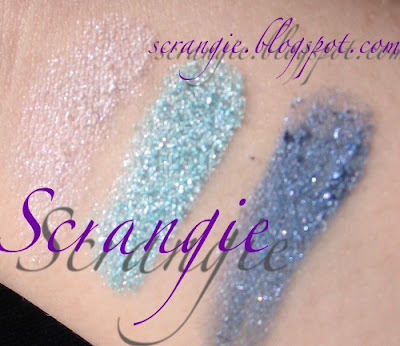 Bell-Bottom Blue has glitter, bonus! Mutiny is gorgeous, but I don't see myself wearing it too often. I'll have pics of some of the OPI Retro Fun In The Sun polishes next week, so stay tuned. Rescue Beauty Lounge polish comparison. 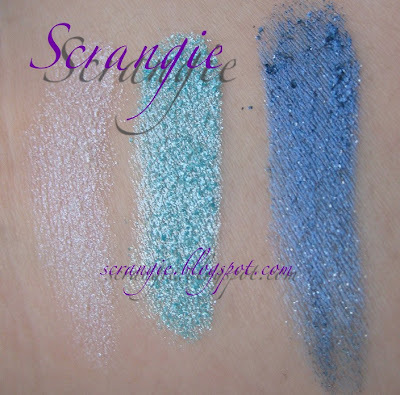 More Rescue Beauty Lounge swatches. OPI Designer Series, part 2. OPI Designer Series, Part 1. Kat Von D Ludwig Palette Look. Kat Von D Beethoven palette look. LUSH... not worth the hype. I promise not to awaken Mustakrakish.